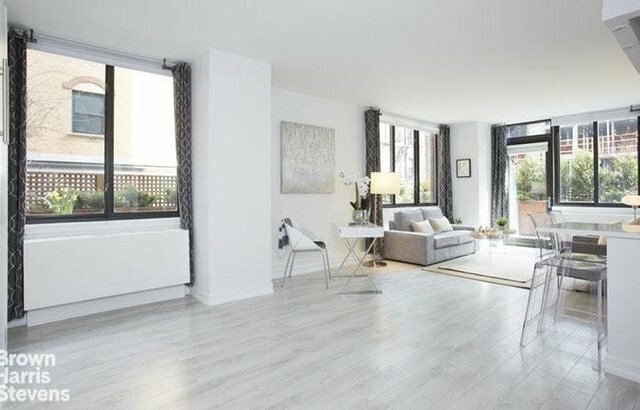 Modern, renovated studio with huge wraparound terrace on coveted 2nd floor of Nolita Place Condominium. Of the 66 units in the building, only the six residences on the second floor have the sought after non-deeded terraces, each enclosed by beautiful, irrigated foliage planters for privacy. Residence 2-B has one of the largest individual terraces, which provides a perfect extension of the home's interior space. Whether it is dining alfresco, fine entertaining or simply practicing on your private putting green, this is the perfect place to call home. The lovely kitchen has white quartz countertops, Carrera herringbone marble backsplash, stainless steel appliances and has been opened up to accommodate a lovely breakfast bar. High ceilings, double exposures and oversized windows with views of the terrace in all directions complete this wonderful abode. Nolita Place Condominium is a 24-Hour concierge, elevator, pet-friendly building with on-site superintendent, gym and roof-deck located close to great restaurants, shops, Whole Foods, art galleries and public transportation.